Muffins are the perfect food. Not too sweet, not too messy, fairly portable, fairly convenient, and, if done right, fairly healthy. I didn't like any of the vegan muffin recipes we tried. Most of them were either too sweet, too mushy or both. After a dozen fails, we decided to start with a regular muffin recipe from one of my magical vintage cookbooks and go from there. Of course, they were fantastic, and the muffin dough itself wasn't sweet at all. It's the add-ins that make the sweetness. I love that. But I still wanted a vegan, whole wheat, no-refined sugar version, so we started tinkering, and tinkering, and tinkering... and finally, we did it! A vegan, whole wheat, no refined sugar muffin. First off, we need to make a vegan version of buttermilk. ...and then add unsweetened almond milk until you have a total of 3/4 cup liquid. Set that aside, and then measure your dry ingredients into a mixing bowl along with 1/3 cup honey OR 1/2 cup of brown rice syrup if you are vegan. Back in your liquid measure, add water to bring the total liquid to the 1 3/4 cup line. Then add oil to bring it to the 2 cup line. Add all the liquid to your mixing bowl. Stir until the dry ingredients are mixed in, but don't overdo it. You'll probably have lumps, and that's okay. Just mix until everything is wet and stop. Now you can mix in your chocolate. If you have chocolate chips on hand, you can mix in 1 cup of chocolate chips. Or, if you are out of chips (I'm not mentioning any names here) you can chop up a chocolate bar. (Never done that? See the tutorial on how to chop up a chocolate bar). We try to use vegan fair-trade chocolate, and to keep with the "no refined sugar" idea, we try to use grain-sweetened chocolate as well. Finally, oil up a muffin tin with space for 12 regular muffins. I use the same olive oil to coat them, but you can use whatever you like. Divide the batter evenly between them, and bake at 400 degrees for 20 minutes or until a toothpick comes out clean. I did notice that they take a few minutes longer with the brown rice syrup, so keep that in mind. Cool on a rack and enjoy!!! 2. 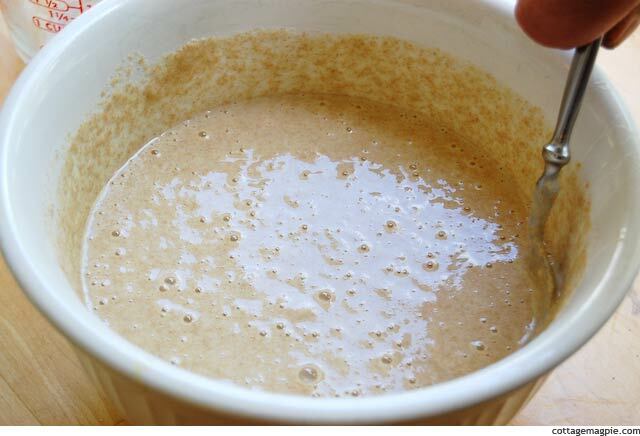 Measure apple cider vinegar into liquid measure, then add unsweetened almond milk until the total measures 3/4 cup. 3. 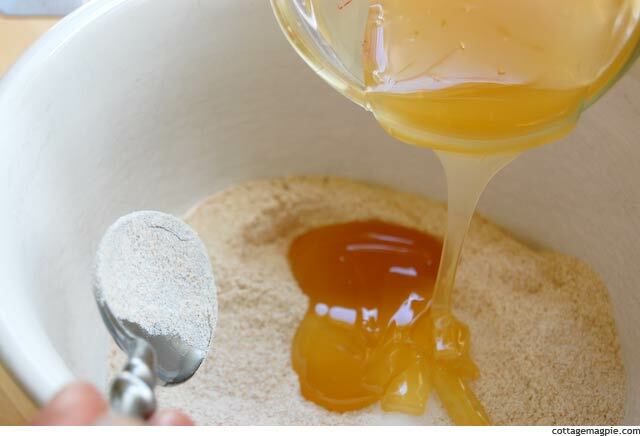 Measure dry ingredients (flour, baking soda and salt) into mixing bowl, and add your choice of honey OR brown rice syrup (vegan). 4. 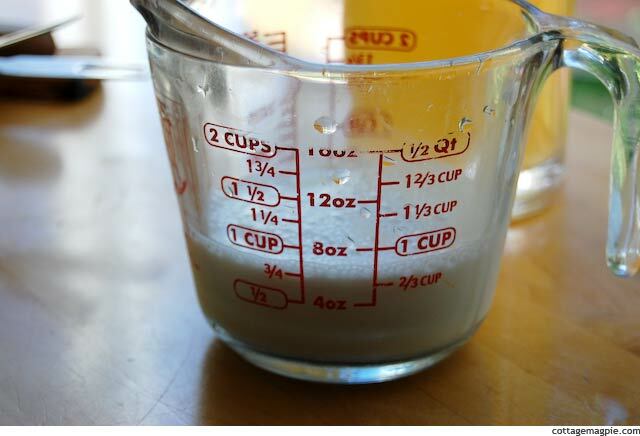 To the milk and apple cider vinegar mixture, add 1 cup water and 1/4 cup oil. Stir just until dry ingredients are incorporated. Don't over mix. 6. Oil your 12-count muffin pan and divide batter evenly between them. 7. Bake at 400 degrees for 20 minutes or until a toothpick inserted in the center of a large muffin comes out clean. 8. Let cool for 10 minutes in the pan, then turn out to continue cooling on a wire rack. So tell me, what's your favorite mix-in with muffins? What's Behind Door Number Seven?